If you only had 24 hours to spend in Columbus, what would you do? This was a hard question for me to answer, but I’ve come up with a list of must sees and must dos that I feel will leave any visitor with an experience uniquely Columbus. I’m sharing these ideas in a three part series - the first post is geared to families, the next to the business traveler, and finally, a post to help a local decide what to do with visiting friends or family. Here’s part two of three, with suggestions geared to the business traveler. With Columbus being the state capital and the home of 14 Fortune 1,000 companies (six of which are Fortune 500), it is a frequent stop among business travelers. The city is located within a one-day drive or one-hour flight of nearly half of the population of the U.S. and Canada, so those who do travel here may be in and out of town in a day or after a brief overnight stay. Here are some helpful tips and recommendations to make the most of your visit. Where to Stay Like I mentioned in the family travel post , there are several great hotel options at varying price points around downtown - click here to check them out. One property great for business travelers is The Columbus, A Renaissance Hotel , located on N. 3rd St. in the heart of downtown and near the capital, Nationwide Arena and the Greater Columbus Convention Center . The Columbus has the city’s only seasonal rooftop pool with great views of downtown; it&apos;s often the site of an impromptu happy hour and always a great place to relax or swim a few laps. The hotel also has Wi-Fi access throughout, a large lounge and bar in the lobby. If you&apos;re staying at The Columbus, I recommend dining at Latitude 41 . It&apos;s located in the lobby of the hotel and it&apos;s known for unique American cuisine. Also, a quick walk down Gay Street (across from the hotel) offers several unique Columbus restaurant options including fine Italian at Due Amici , great comfort food at Tip Top Kitchen & Cocktails and Cuban cuisine at Plantain Cafe. 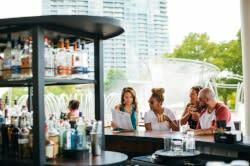 Once you&apos;re done with business, a few great places to get dinner and a drink with locals downtown include the Elevator Brewery and Draught Haus , M restaurant, Mitchell’s Steakhouse and The River Club at Confluence Park . Another uniquely Columbus eatery is our public market, the North Market . This is one of my favorite places to grab a quick bite and people-watch, as it is home to dozens of unique, independent merchants and farmers. Merchants offer ethnic food specialties, gourmet groceries, flowers and gifts. Wi-Fi Hot Spot A staple for any business traveler is Wi-Fi, and Cup O’ Joe offers it free at their café and eatery locations. You&apos;ll find them just north of the Greater Columbus Convention Center on High Street, and also in German Village , Easton Town Center and the airport (which, by the way, also offers free Wi-Fi). To De-Stress After a long day of doing business in Columbus you may want to unwind. For this, I recommend you make a stop in the Short North Arts District , just north of the heart of downtown. Here you’ll find art galleries, independent dining and retail, all under the lighted arches spanning High Street. One great place to de-stress in the Short North is Mukha Medi-Spa , which offers massage and body treatments, hair and nail treatments, and custom cosmetics designed to fit each individual’s skin and needs. If a stroll through the park or people watching is more up your alley, especially on a nice day, stop in Goodale Park . Also located in the Short North, it has a great community garden, pond, walkers, joggers, tennis players and is never short on four-legged friends. Nightlife You&apos;ll find great nightlife in the Short North Arts District, as well as in the Arena District . The Arena District is filled with bars, restaurants, Nationwide Arena (where you might catch a Blue Jackets game or concert) and also the Arena Grand Movie Theatre , complete with a bar and restaurant. Next week, look for the third and final post in this series, where I&apos;ll provide locals with ideas on what to do with visiting friends and family.